Perfectly balanced combination of sports and tourer. Packaged with class leading V-Twin power, sophistication and comfort for the weekend getaway, the KTM 1290 SUPER DUKE GT is always READY TO RACE. 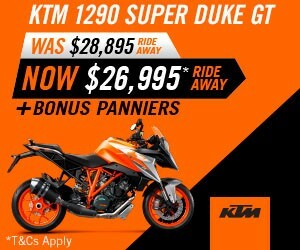 For a limited time only the MY18 KTM 1290 SUPER DUKE GT is priced at $26,995 Ride Away and includes bonus genuine panniers. At your command, the beast will roar to life. Packaged with class-leading V-Twin power, the KTM 1290 SUPER DUKE R is the pinnacle of naked bike performance with READY TO RACE DNA. 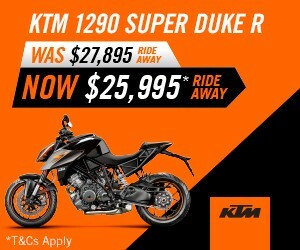 For a limited time only the MY18 KTM 1290 SUPER DUKE R is priced at $25,995 Ride Away.